Why, some people can’t afford to dine at The Ritz anymore. Thanks to Sally Coleman, who posted this article on Facebook. 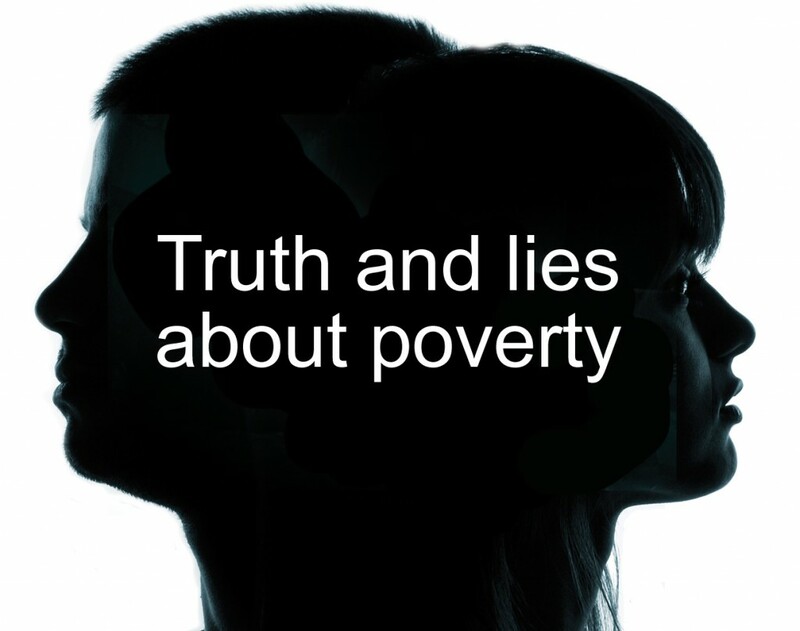 Today, the Joint Public Issues Team representing the Methodist, Baptist, United Reformed Churches and Church of Scotland publishes a report called ‘The Lies We Tell Ourselves: Ending Comfortable Myths About Poverty‘. It’s an important report anyway, but its publication is all the more timely in a week when the Royal Bank of Scotland has announced yet another multi-billion pound annual loss yet has managed to pay £215m in bonuses to investment bankers. Although I left working in Social Security to study Theology in 1986, it is sobering to see that over a quarter of a century later, many of the same myths still have to be exploded. The report lists six myths that are propagated by some members of Government and parts of the media, and which are sadly swallowed by some people. In my experience, the vast number of benefits claimants wanted to work. Their pride and self-esteem were badly hurt by unemployment or chronic sickness. Only a few had addictions. A certain number would spend their money wrongly, but not the majority: this, after all, is also the week when schools have reported children bringing in poor packed lunches such as cold chips, due to poverty. And aren’t we the society that has lived on ‘rampant consumerism’? Very few are on the fiddle, but set that against how much money is kept by the tax tricks of the rich. The idea that a benefits life is an easy life is ridiculous: you try living on that income level. And most preposterous of all is the contemporary claim that the poor caused the deficit. The report has gone to every MP. Suggestions for action by ‘ordinary’ people can be found here: they involve contacting our MPs and our local newspapers. I have told a story on here somewhere before about making a visit to a school with our children, where we witnessed a display in the entrance hall about a link the local community had with a Ugandan village. The local people there relied on growing and selling chillis to eke out a meagre existence. Our kids were 7 and 5 at the time, and we had to explain huge issues, because they couldn’t initially believe that people lived in such desperate straits in our world. Trying not to show considerable surprise, nor wishing to pour cold water on his noble ambition, and secretly pleased, we asked him how he proposed to do this. Mark retains his passion for Africa. 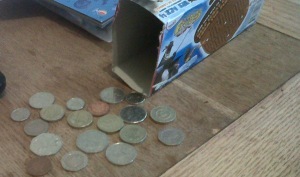 He still doesn’t spend much of his pocket money or other gifts he receives. Why am I retelling this story? Because another young boy in a Christian household is doing the same. Read Joel Vs Poverty. The difference is, Joel is getting into fundraising for TEAR Fund as a result. Not only has he written ‘Poor Box’ on an old cardboard Frubes container, he has decided to do a sponsored run on 23rd June. He has a page on Virgin Money Giving where you can donate to the cause. There is a hashtag on Twitter to help you follow what’s happening, and it’s #TeamJoel. However, the important thing is not only to do clever social media things, but to use them in the service of giving and of changing our world. So the bishops in the House of Lords supported an amendment that defeated government plans that would have limited benefits in such a way as to penalise the children of poor families. Predictably, the government didn’t like this. It feels like 1985 again, with ministers briefing that the ‘Faith in the City‘ report is Marxist. It doesn’t matter whether I think they’re right or wrong; I think it’s their job to do what the Bible tells them to do, ie look out for the needy, like the innocent children on whose behalf they raised the amendment, who might otherwise get lost. The right-wing press that is so angry with the bishops has been complaining for years that Christianity (for better or worse, our national religion) is too weak and small a voice, that its values are not fought for. Now it’s happening, they hate it. Their hands are tied. The gospels say what they say. If their lordships wanted to support the idea that handing out bread and fish is bad for people because it demotivates them from doing their own baking and fishing, they’d really have to leave the pulpit and get a job on a tabloid. And while the Stephen Hesters of this world, already paid 1.2 million loaves a year of arguably public bread, are being given fish factories as bonuses, the church can hardly join in with a move to reduce herring portions for the hungry. It would look ridiculous. If this were X-Factor for journalists, Louis Walsh would be saying, “You nailed it.” The Bible calls us to be fair, but it calls us to a special concern for the poor. She therefore argues it’s unfair for the bishops to be criticised. They are only doing their job. Quite right, too. However, it shouldn’t surprise us as Christians. Critique the powers that be and opposition will come. Jeremiah, John the Baptist, Jesus – all suffered. While being on the receiving end of criticism isn’t a guarantee of doing a good job, it may be a sign that the bishops scored a bullseye. More worrying for me was the criticism by my former college principal, George (Lord) Carey. In an article in (of course) the Daily Mail, he seems to stereotype almost all people on benefits as being part of a dependency culture. Yes, some are, but overall – surely not! He knows all about growing up poor in the 1940s, but the pride of poor people he knew then in Dagenham still exists in many quarters, whatever else has changed. And yes, the national debt of £1 trillion is a scandal, but it was a scandal caused by the reckless folly of big business and a culture devoted to consumerism – a consumerism heavily promoted by the government that nominated him to the Queen first for Bath and Wells and then for Canterbury. So well done the bishops, keep it up, whatever is thrown at you. It’s not what you know, it’s Who you know – Marijke Hoek on Christian approaches to tackling social inequality. It’s extraordinary to me that the United States can find $700 billion to save Wall Street and the entire G8 can’t find $25 billion dollars to saved 25,000 children who die every day from preventable diseases. – Bono, from yesterday’s Sojourners weekly email, via The American Prospect. Canada, France and Italy are threatening to break their poverty promises by slashing aid budgets. Sign the petition to stop them — and poverty expert Jeff Sachs will deliver our messages to world leaders gathered at the UN this week! World leaders gather this Thursday at the United Nations to renew the fight against extreme poverty. But three countries — France, Canada, and Italy — are threatening to undermine the world’s anti poverty efforts, by slashing their development aid budgets and breaking their international promises. Sarkozy, Harper, and Berlusconi promised to contribute 0.7% of their national income to fighting poverty — aid money that would save millions of lives, and still leave these donor countries with 99.3% of their money. But apparently, they think 99.3% is not enough. We know that public outcries like this one can work — because massive people-powered movements have transformed the fight against poverty over the last decade. The Jubilee movement cancelled hundreds of billions in dictator debt in 2000, and pushed world leaders to adopt the Millennium Development Goals to cut world poverty in half by 2015. In 2005, poverty campaigners the world over won commitments from G8 leaders to double aid to Africa. Because of these efforts millions of poverty related deaths have been stopped and millions more children are attending school, sleeping under anti-Malaria bed nets, and drinking clean water. Denmark, Luxembourg, the Netherlands, Norway and Sweden have all exceeded the 0.7% target and in this year aid rose in real terms in nine EU countries. If all countries stick to their promises, programmes fighting disease and alleviating extreme poverty could be scaled up across the world. But this year, some rich-country leaders apparently think that the public no longer cares about poverty. In Canada, which kept 99.7% of its income last year, Stephen Harper seems more interested in winning his election than in upholding Canada’s tradition of moral leadership. France’s Sarkozy, for all of his diplomatic efforts, appears to think that his people don’t care about lives and deaths beyond his borders. And in Italy — already one of the stingiest donors in the world — Berlusconi appears happy to slash crucial funding, even though, as host of next year’s G8 summit, his actions set an example for the other richest countries. In recent years, millions have been galvanized by a vision: that ours can be the generation that ends extreme poverty. With other crises vying for our attention, the strength of this vision is now being tested. Let’s join together and ensure that leaders keep their promises — so that the promise of human potential in even the poorest communities can be unleashed. Click here to learn more about our largest campaigns. Don’t forget to check out our Facebook and Myspace and Bebo pages!